side release buckles (see our plastic fastener page). The grosgrain is available in a SOFT style and a FIRM style. The soft style is more recommended for binding edges and the firm works well for use as a lightweight webbing (ie: tent pullouts, strapping but note on some buckles it may be too slippery with buckles that are under tension). Strong, durable with a resin coating to make it stiff. The most commonly used webbing for outdoor gear. A nice flat weave allows it to work well with almost all buckles. Good webbing for long time sun exposure and marine use. 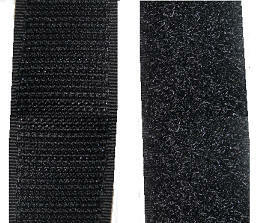 Has a coarser, “loopier” weave than the nylon webbing. A very lightweight nylon webbing. It's especially good for binding off fabric edges. shorts and running wear and waistbands to keep shirts tucked in place. 100% nylon, sandwich along raw edges for finished appearance. than the nylon bias binding. Works well around gentle curves. 2" wide by 32" Iron on reflective tape by Bondex. Could be sewn on if preferred. The hook side is the coarse portion of the fastener and the loop side is the soft portion. Each side sold separately for your convenience. The hook side is the coarse portion of the fastener and the loop side is the soft portion. Adhesive backed does not require sewing. This style of hook and loop has the hook on one side of the tape and the loop permanently attached to the other side of the tape. Great for use on gauntlets of gloves or for binding items together using only one piece of hook and loop. This unique, sew-on style of hook and loop has both the hook and the loop together in alternating rows on one side of the tape. The loop stands above the hook buffering them from snagging fabrics and giving them a soft touch against the skin. Pressing firmly, it sticks well to itself and yet does not pick up lint like traditional hook fastener does. It also does not stick to other fabrics, like no-see-um mesh thus keeping the fabrics from snagging. Uses: great for cinching straps- easily adjustable to tighten and loosen. Also, being used to to keep your sleeping quilt attached to your sleeping pad while sleeping by sewing one strip to your quilt and glueing another strip to your sleeping pad to attach the quilt to pad and eliminate cold spots. 100% polyester, strong, durable thread by Gutermann, resistant to abrasion, wear and mildew. Very suitable for almost all outdoor sewing. mounts the cone can be placed on the tabletop beside the machine. THREAD -GUTERMANN EXTRA STRONG WT. Gutermann extra strong 100% polyester thread is ideal for fabrics such as denim, leather, furniture, tents etc. This high quality thread offers a high break point and is specially designed to cope with highly stressed seams. Gutermann thread is highly recommended for items that will incur long-term sun exposure or abrasion. Gutermann has a stronger tensile strength than "regular over-the-counter" thread but both have approx. the same diameter (thickness) so the Gutermann works well on household sewing machines.